at my kitchen table: Are You Serious? 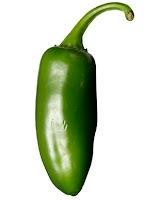 I went to Meinhart's today (a somewhat pretentious, upscale grocery store) to pick up a jalapeno. When I got to the cash, handed the girl my single item and asked if I could have a bag she lost it. "ARE YOU SERIOUS???" she said. Good for her, I thought. I told her I was kidding and she said that I'd be surprised the number of people that would be serious. Reaction of Meinhart's cashier? Priceless. Hilarious. I've all but given up joking with clerks as the majority just don't seem to "get it"... either that or I'm not very funny. Mmmm, salsa. People like to say SALSA..
Hahaha -- just reading your SALSA I had to say it out loud. SUL-SA.